This is another case of learning from my mistakes. My first ITSM initiative, as a very green ITIL convert, had a couple of false starts. In my excitement I assumed that everybody would get as enthused about processes and functions as I had...if I could see what it could do for our IT department and the entire business, surely anybody else with a brain would "get it" instantly. I think I actually lost them on the first slide when I started talking about UK Government initiatives! So, here are the lessons I learned from my first, abortive, attempt to get that all important management buy-in. Fortunately, I got a second chance around a year later and applied the knowledge I had gleaned from the reaction to my earlier presentation. Before you try to get your support make sure that you understand the business, outside of the four walls of the IT department. Where does the company makes its money? What risks does it face? Where are their potentials for growth? How can well-managed IT services help exploit those potentials? Get your own team onboard first - I made the mistake of trying to get a budget for the initiative without winning the support of the team I was working with, and there were some real doubters in there. In hindsight it would have actually been pretty easy to gain, at least tacit, agreement that ITSM could improve the way we worked...that way they wouldn't have sabotaged my presentation! Paint the big picture...don't get weighed down in the minutiae of service management. Unless that is the world you live in, it really is not at all exciting....I know, hard to believe isn't it, but not everyone gets excited about incidents, service requests, problems, changes, releases and SLAs! Second time round was the charm, the right people were there, the budget was open, my team was enthusiastic and supportive, and we showed the business how we could improve their bottom line by delivering innovation, reducing support costs and, most importantly, increasing customer satisfaction. 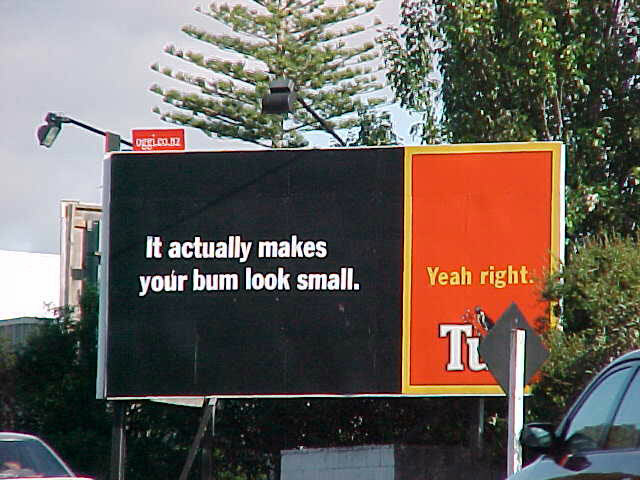 For those of you who didn't get the "Yeah, right" reference above....below is a typical New Zealand Tui Billboard (Tui is a local brand of beer). I think it’s great that you share your common sense and your mistakes with the community. It’s strengthening for us who struggle. Thanks Tobias, I have to say I am really enjoying this now I have got started!